Stanley, exhausted after digging his first hole, returns to camp. He enters the recreation room, which is called the wreck room. Everything in the wreck room is broken. Stanley bumps into a large boy who tries to pick a fight with him. Stanley tries to avoid the fight and X-Ray and Armpit come to his rescue saying, "You don't want to mess with the Caveman." Stanley, Armpit, Squid, and X-Ray talk about the trouble of digging holes. 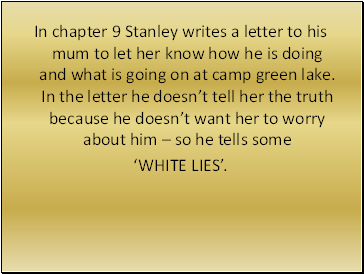 Stanley has brought his box of paper to the wreck room because he wants to write a letter to his mother. When he explains to Squid that his mother will worry if he doesn't write to her, Squid scowls at him. Stanley notices that the entire room is wrecked because the boys themselves have broken the things in it. 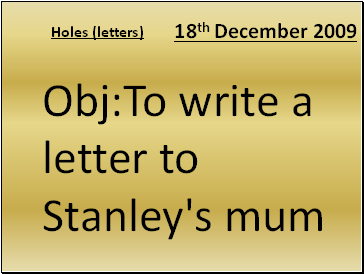 Stanley waits until Squid leaves before writing his letter. 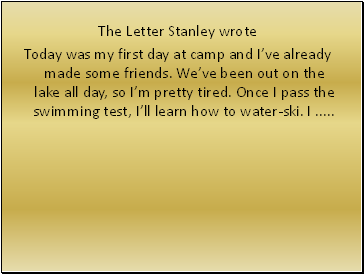 When Stanley does write to his mother he tells her he is having fun and swimming a lot. In the middle of writing his letter Stanley notices that Zero is staring at his letter. Zero asks Stanley, "Did the shoes have red X's on the back?" 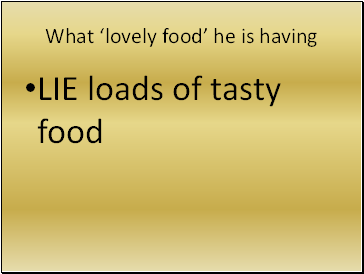 Stanley responds that they did and then hears Armpit and Squid calling Caveman to come to dinner. 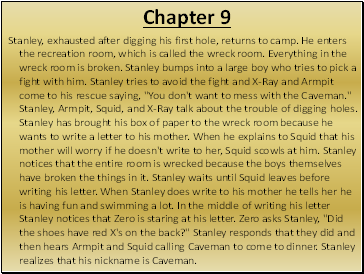 Stanley realizes that his nickname is Caveman. Today was my first day at camp and I’ve already made some friends. 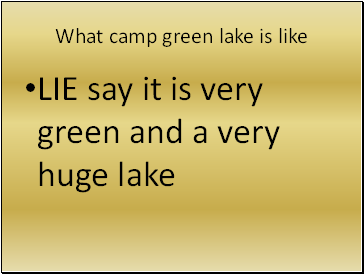 We’ve been out on the lake all day, so I’m pretty tired. Once I pass the swimming test, I’ll learn how to water-ski. 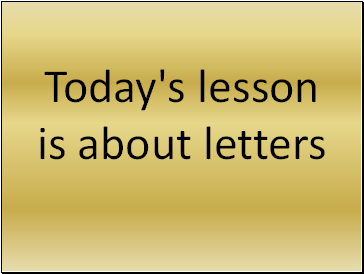 I . 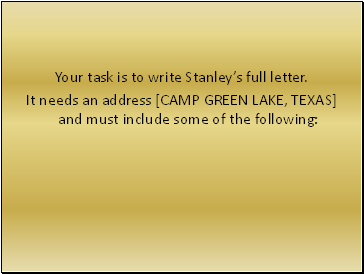 Your task is to write Stanley’s full letter. 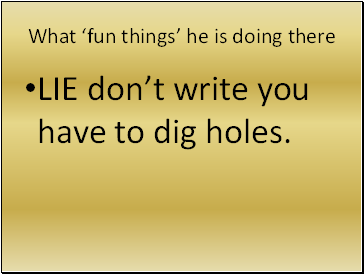 LIE don’t write you have to dig holes.